Curated by: Alessandra Redaelli Deeply-rooted in the Varese environment, but with a past of extended stays in New York (in particular in the golden years of Pop Art), ALBERTO MAGNANI is the protagonist of the exhibition which opens the new season at PUNTO SULL’ARTE. 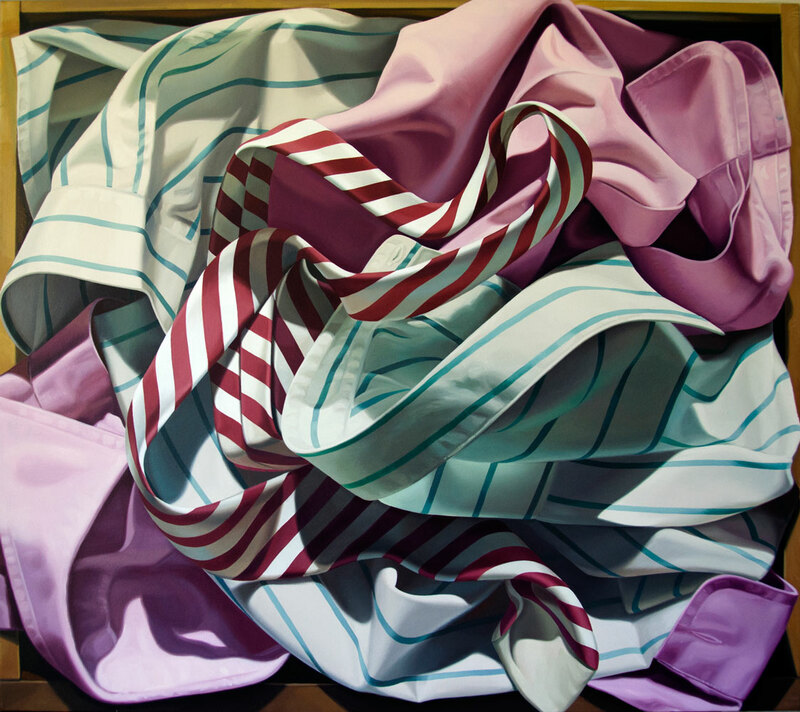 VERNISSAGE SATURDAY 8th SEPTEMBER H 6-9PM.Alongside his better known works – the series of shirts hanging in the wardrobe, the tangle of ties – here the artist reveals to the public the latest evolution of his painting. Without ever belying his fondness for full, saturated, and gaudy colours, and for the highest definition of detail, today Magnani incorporates a series of new subjects that range from bicycle or motorbike helmets to masks, both African and those associated with the Venice Carnival. Placed one beside the other, the objects elicit a disorientation in the viewer caused by the short circuit between the absurdity of association – of purely surrealist flavour – and the cleanest pictorial rendering. Comprised of more geometric and meticulous compositions than those of clothing, in reality these works complete a lucidly coherent journey into the void. From the clothing deprived of its owner – but in some ways incredibly alive – through the series of frames without pictures, the artist now arrives at these new vessels which only the imagination of the viewer can fill. A subtly conceptual game (although conducted according to the rules of figurativism) which complicates and stratifies itself into new meanings from the moment in which the double spirit of the mask is understood, on one hand designated to conceal, but also, on the other, by virtue of anonymity, to show the wearer’s deepest nature.ALBERTO MAGNANI was born in 1945 in Arborea (Oristano). He graduated from the Liceo Artistico of Brera in Milan in 1965 and in 1974 visited the United States for the first time. From 1970 he holds numerous solo shows and group exhibitions in Italy, Europe and the United States and contributes to graphic design projects. In the ‘80s he alternates extended stays in New York with frequent breaks in his studio house in Induno Olona. His works are strongly conditioned by his overseas experiences and above all by American Pop Art and by hyperrealism. Through photographic but extremely connotative output he seeks to restore vitality and personality to the objects. His work involves men’s clothing, brightly colored ties, elegant shirts, but also frames, African masks and humble, everyday objects like paper bags. He lives and works in Varese.